The opportunity to transfer his passion for hockey to the business world presented itself to Bernie when an eye injury forced him to retire from hockey in 1979. Although Bernie's career was restructured, his position as a dominant figure in the community did not waiver. As Bernie began to address audiences with his inspirational yet practical message, he renewed his status of a proven champion who has faced life's challenges to come out on top of the game. Using a blend of sincerity, credibility, and wit, Bernie's presentations show how hard work and determination can lead to grasping the winning edge not only in professional sports, but in the business arena. Bernie Parent has spent the last 30 years consulting and endorsing local and national business with his energetic expertise and popularity, consistently achieving high ratings and standing ovations. He has lent his credibility to various functions including corporate meet-and-greets, awareness campaigns, autograph signings, product endorsements, association conferences, key client appearances. "Only the Lord saves more than Bernie." 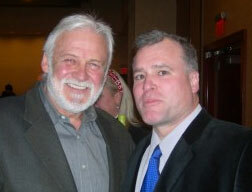 From the moment he engages an audience, Bernie Parent captures the hearts and minds of every listener with an exciting presentation that will inspire your group to achieve a higher level of personal effectiveness and professional goals.Working with Bernie over the years not just flyers fans embrace him all sport fans . 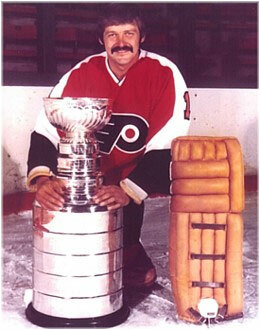 everybody has heard the name Bernie Parent!